The Pet Wiki > All Pets > Pet Safety > How do I keep my pet safe at holidays? September 20, 2011 Comments Off on How do I keep my pet safe at holidays? The holidays are a fun time. Who better to spend them with than our pets. Here’s a few pointers for keeping your anipals safe during the festivities. Enjoy your holidays! At Halloween, one of the best ways to ensure your pets safety is by keeping them indoors. This way pranksters won’t be able to get to them. When opening the door for Trick or Treaters, make sure your pet doesn’t run out by keeping him in another area of the house or teaching him the sit/stay command until you’re sure he obeys completely. Make sure any decorations are out of reach of your pet. Chewing on these items can cause choking. If you have lit candles in your jack-o-lanterns, be sure your pet doesn’t knock them over and cause a fire. Dogs should not accompany your Trick or Treaters. Children can have difficulty handling a leash and a basket of goodies. And your dog can become confused and frightened by the strange goings on. Costumes for pets can be fun to look at. But please supervise and dress them for only a short time. Most pets don’t really enjoy dressing and trying to escape costumes can cause injuries. Don’t allow your pet to have ANY candy. Chocolate is particularly toxic to pets and can kill them. to be left out of the fun. Here are some tips to keep them safe during the holiday season. Keep ornaments and other decorations high on the tree so curious pets can’t reach them. Rabbits find electric cords chewable so try taping them to the floor to discourage them. Perhaps keep the rabbit away from the tree area. If you have a fireplace or light any candles including candles for menorahs, keep watch that your pets don’t venture near anything burning. Extinguish any fires if you are not home to monitor them. Strings and ribbons from gift packages can cause choking if your pet chews them. Don’t string food on the tree as pets will want to try and reach them. If at all possible place decorations high on the tree so that they are not within reach of your pet. 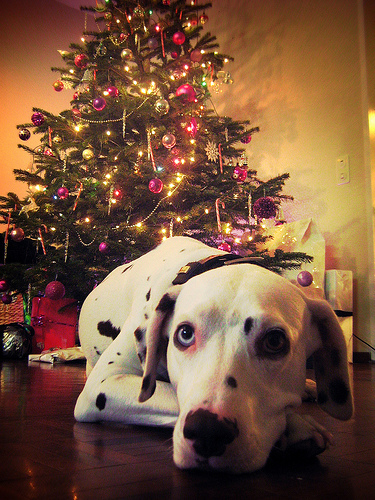 Don’t allow your pet to drink water that the tree has been placed in as it can be toxic. Don’t leave gifts with unknown contents or gifts that contain chocolate under the tree. A pet’s keen sense of smell can detect food even in wrapped packages and they could prove toxic to your pet. Care should be taken with food. Some table scraps can be toxic to your pet. Don’t leave chicken or turkey bones where your pet can get them. Foods that are toxic to your pets include chocolate, raisins, macadamia nuts, alcohol. If the weather turns snowy or icy, when outdoors with your dog, try to avoid salted walks. Chemicals can damage your dog’s paws. Clean your dog’s paws with warm water when you get home to be safe. Easter is a lovely time of year. But again, here are some considerations for your pets. Eggs whether plastic or dyed can be attractive to a curious pet and a danger if chewed or swallowed. Keep track of all the eggs and please be sure you have all of them after the hunt. Easter grass is a grave danger especially to cats who find it particularly attractive and may swallow it causing intestinal damage. Consider packing Easter baskets in an alternative way, perhaps using real grass or paper. As beautiful as Easter lilies are, they are highly poisonous to your pets. You can purchase faux lilies or make your own look-alike lilies or consider substituting with a similar flower that’s not poisonous. Keep all candy, especially chocolate out of reach of your pets. Throw wrappers away ASAP as they can cause damage to your pets if swallowed. Keep all small toys out of reach of your pets. Any small object can be a choking hazard. All pets should always have collars with IDs and microchips in case they manage to escape and are lost. They can be safely returned to you with proper identification. 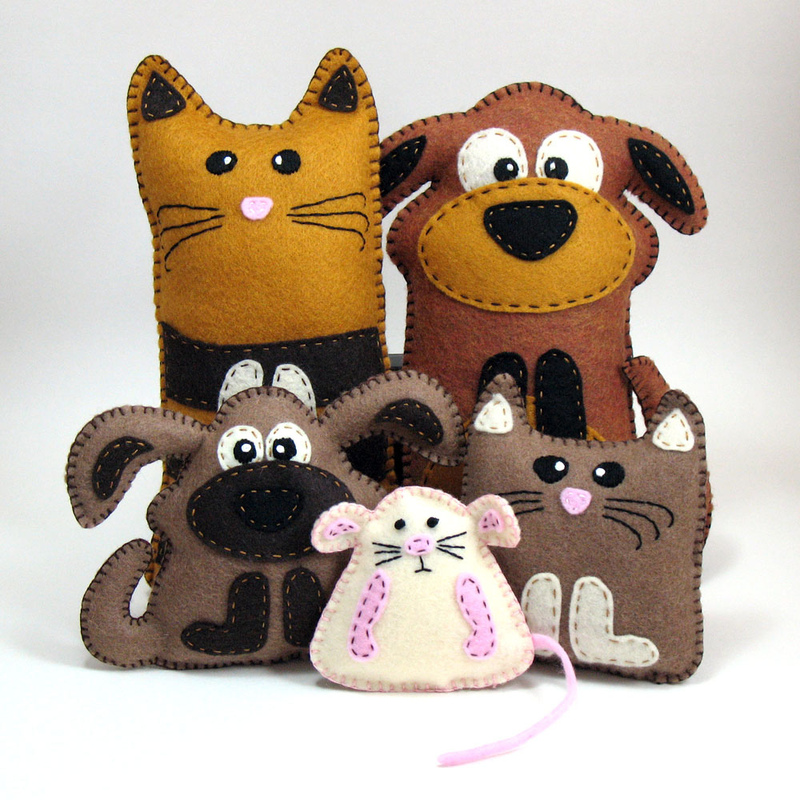 Just a thought – If you are considering buying a pet as gift, please read our article Do You Really Want a Pet? A pet is a responsibility for many years, so please think carefully about making the commitment.